Irrigation systems consist of three interdependent components involving: the irrigation scheme, the on-farm management and the organizations. The irrigation scheme refers to the infrastructure for water acquisition and distribution (water delivery). 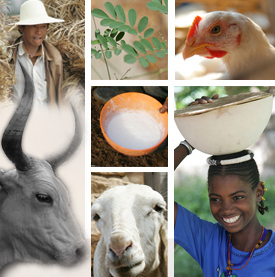 This working paper focuses on water delivery performance of 10 smallholders irrigation schemes in four regions of Ethiopia, representing diverse water sources, distribution systems, command areas (50–6000 ha) and number of beneficiary farmers (233–500 farm households) and across agro-ecologies as represented by elevation ranges (1500–2725 masl). Relative irrigation supply (RIS), irrigation intensity (Ii), cropping intensity (CI), farm level adequacy (FLA), sustainability of irrigated land (SIL), and equity and field application efficiency were employed as performance indicators. The results show that irrigation typology developed in this study enabled to identify three relatively homogeneous irrigation schemes typologies: modern, semi-modern and traditional. There was apparent diversity of the study schemes in terms of indicators used. At typology level, as illustrated by the RIS, the highest amount of water was diverted for semi-modern schemes (RIS of 3.84); while the highest water delivery at farm relative delivery (FRD) was recorded for the modern schemes (FRD 2.21). Traditional schemes consistently showed lower value for both RIS and FRD. Regardless of their typologies, all study schemes suffer from mismatch of water demand and supply. The lower the RIS and FRD values, the stronger was the water supply disparities between irrigation reaches. Assessment of farmers’ perception on fairness of irrigation water delivery substantiate these arguments. Implicitly, it is important to track the fate of diverted excess water. 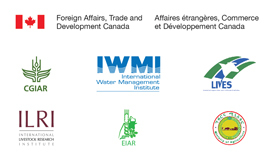 Field observation and empirical evidences show divergent points of losses of excess water indicating focus areas of improved water conservation on smallholder irrigation schemes. For example the largest proportion of over supplied water (~100%) in the semi-modern schemes and in traditional schemes was lost in the conveyance and distribution systems. For modern schemes water losses in the processes of conveyance was low (26%), while the significant proportion of water (76%) was lost on farm. In view of this evidence, we concluded that irrigation schemes in Ethiopia, regardless of their typology, have low water delivery performance. As every scheme has shown its own strength and weakness, concluding sustainability in terms of typology is misleading and this suggests that policy directions should be based on composite sustainability indices. Agide, Z., Haileslassie, A., Sally, H., Erkossa, T., Schmitter, P., Langan, S. and Hoekstra, D. .2016. 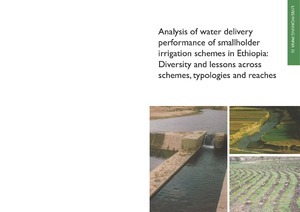 Analysis of water delivery performance of smallholder irrigation schemes in Ethiopia: Diversity and lessons across schemes, typologies and reaches. LIVES Working Paper 15. Nairobi, Kenya: ILRI.